I was trying to identify which key is pressed by user so that I can perform operation accordingly. keyup event works perfectly with IE, but it was not behaving as expected for Firefox and Chrome. I have called the above function in following manner. click Event in Firefox and Chrome doesn't work as expected, while it works perfectly with IE. Following piece of code was working perfect with IE, but Firefox and Chrome didn't recognise this event. Solution for Click Event Problem for Firefox, Chrome. Wherever you are using click event as shown above replace that line with following. normal way of making set Focus to textbox controls won't work. Where, txtEmailId is control name. technique to set focus for textbox control. Please refer to new way of posting tweet using Twitter Api, following is old way of posting twitter message and this method is no more supported by twitter. Before started discussing about Twitter Programming. Following is small description about Twitter. 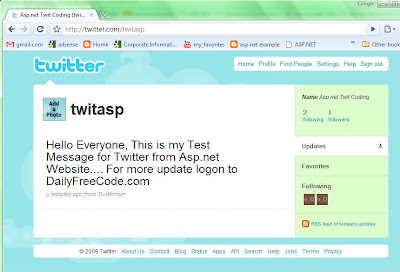 "Twitter is a service for friends, family, and co–workers to communicate and stay connected through the exchange of quick, frequent answers to one simple question" As Twitter is gaining more and more popularity, it is necessary for web master to put all the websites update on Twitter to attract more audience. 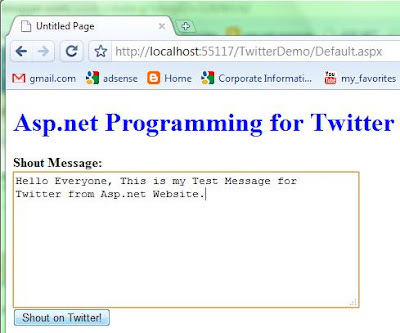 This post will explain, How to post message from your asp.net website to Twitter. To demonstrate this, I would be taking help of Open Source Project which easy, fast and efficient to use. 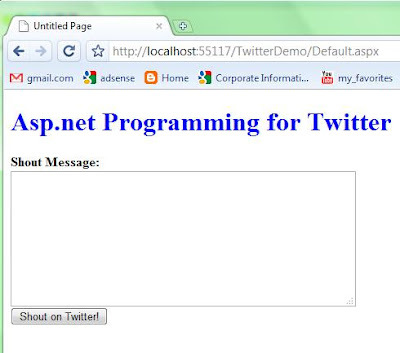 .net project provides an easy to use, object-oriented interface to twitter's online API. Step2: Create New Asp.net Website. Step 3: Arrange the Web Controls as shown in Figure. Step 4: Add Twitterizer Reference. Right Click Website in Solution Explorer, and select "Add Reference" from Popup dialog. Add the Twitterizer.Framework.dll which you have downloaded in Step1. Add following code on Shout button click event. 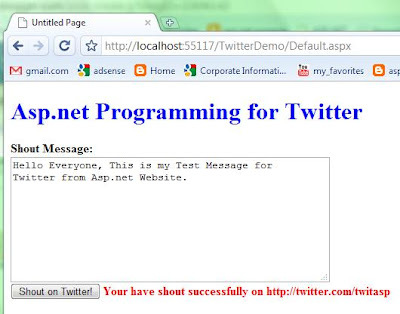 Lets Post one Message from Asp.net Website Developed. Type your Message in Textbox and Press Shout button, you can then check your Twitter website to check whether update is applied or not. Now check the Twitter Website for Profile we have Shout on.